A social media marketing strategy is a summary of everything you plan to do and hope to achieve on social media. It guides your actions and lets you know whether you’re succeeding or failing. Every post, reply, like, and comment should serve a purpose. The more specific your strategy is, the more effective the execution will be. Keep it concise. Don’t make your plan so lofty and broad that it’s unattainable or impossible to measure. In this post, we’ll walk you through an eight-step plan to create a winning social media marketing plan of your own. Bonus: Get a free social media strategy template to quickly and easily plan your own strategy. Also use it to track results and present the plan to your boss, teammates, and clients. The first step to creating a winning strategy is to establish your objectives and goals. Without goals, you have no way to measure success or return on investment (ROI). This is the S.M.A.R.T. goal framework. It will guide your actions and ensure they lead to real business results. Vanity metrics like retweets and likes are easy to track, but it’s hard to prove their real value. Instead, focus instead on targets such as leads generated, web referrals, and conversion rate. 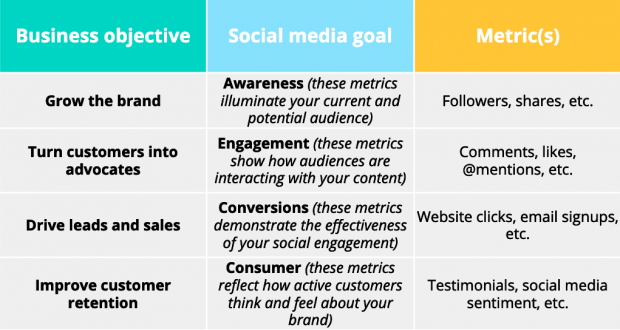 For inspiration, take a look at these 19 essential social media metrics. You may want to track different goals for different channels, or even different uses of each channel. For example, Benefit Cosmetics drives brand awareness with its paid social campaigns, but measures acquisition and engagement for organic social posts. Start developing your social media marketing plan by writing down at least three goals for social media. Knowing who your audience—and ideal customer—is and what they want to see on social is key to creating content that they will like, comment on, and share. It’s also critical if you want to turn social media followers into customers for your business. Try creating audience/buyer personas. These allow you to think of your potential fans, followers, and customers as real people with real wants and needs. And that will allow you to think more clearly about what to offer them. Don’t make assumptions. 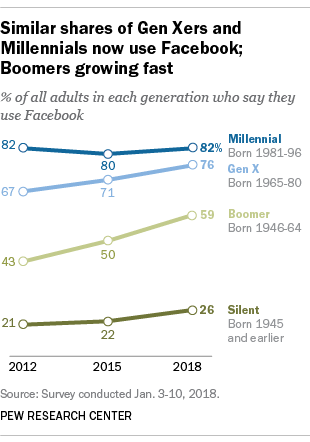 Think Facebook is a better network for reaching Baby Boomers than Millennials? Well, the numbers show that Millennials still outnumber Boomers on the platform. Social media analytics can also provide a ton of valuable information about who your followers are, where they live, which languages they speak, and how they interact with your brand on social. These insights allow you to refine your strategy and better target your social ads. Jugnoo, an Uber-like service for auto-rickshaws in India, used Facebook Analytics to learn that 90 percent of their users who referred other customers were between 18- and 34-years-old, and 65 percent of that group was using Android. They used that information to target their ads, resulting in a 40 percent lower cost per referral. Check out our guide to using social media analytics and the tools you need to track them. A competitive analysis allows you to understand who the competition is and what they’re doing well (and not so well). You’ll get a good sense of what’s expected in your industry, which will help you set social media targets of your own. This analysis will also help you spot opportunities. For example, maybe one of your competitors is dominant on Facebook, but has put little effort into Twitter or Instagram. You might want to focus on the networks where your audience is underserved, rather than trying to win fans away from a dominant player. As you track competitor accounts and relevant industry keywords, you may notice shifts in the way these channels are used. Or, you might spot a specific post or campaign that really hits the mark—or totally bombs. Keep an eye on this information and use to it evaluate your own goals and plans. What’s working, and what’s not? Who is connecting with you on social? Which networks does your target audience use? 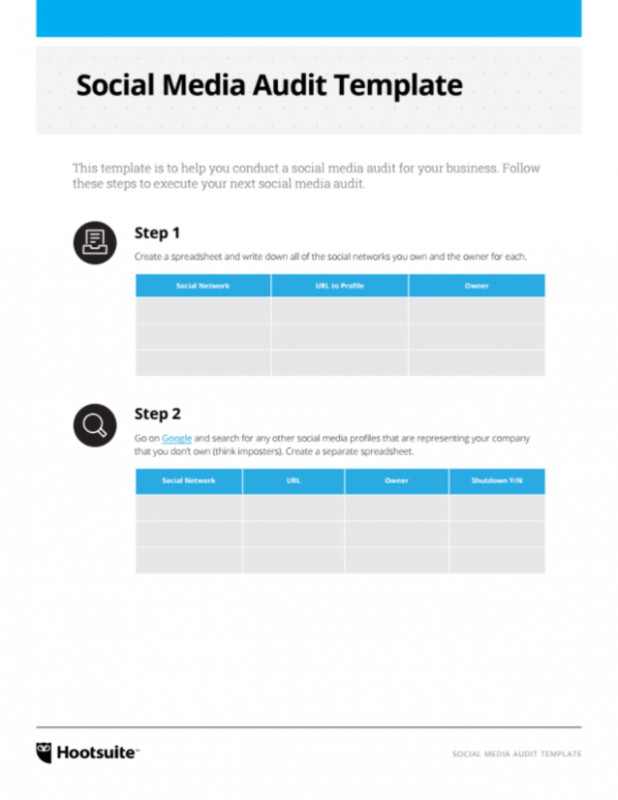 We’ve created a social media audit template that you can follow for each step of the process. Your audit should give you a clear picture of what purpose each of your social accounts serves. If the purpose of an account isn’t clear, think about whether it’s worth keeping. Asking these tough questions will help keep your strategy on track and focused. During the audit you may discover fraudulent accounts using your business name or the names of your products. These imposters can be harmful to your brand, never mind capturing followers that should be yours. Report them. You may want to get your Facebook and Twitter accounts verified to ensure your fans and followers know they are dealing with the real you. As you decide which social channels to use, you will also need to define your strategy for each network. 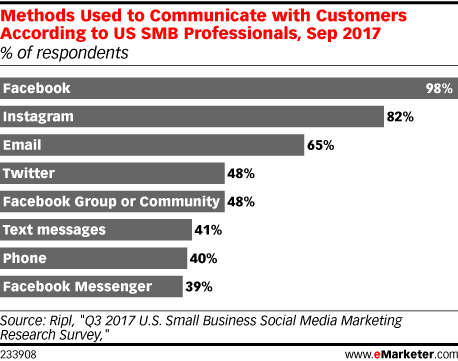 For reference, here’s how other small and medium-sized businesses are using social tools to communicate with customers. Notice that Facebook and Instagram outrank even email for this purpose. Don’t let this list overwhelm you. Remember, it’s better to use fewer channels well than to stretch yourself thin trying to maintain a presence on every network. Get the free template now! While it’s important that your brand be unique, you can still draw inspiration from other businesses that are great on social. These case studies can offer valuable insights you can apply to your own goals for each social network. You could also check out the winners of The Facebook Awards or The Shorty Awards for examples of brands that are at the top of their social media game. Your favorite brands on social media. Who do you enjoy following on social media? What do they do that compels people to engage and share their content? National Geographic, for example, is one of the best on Instagram, combining stunning visuals with compelling captions. Photo by @ladzinski | Sunset casts down rays of light onto the endless karst formations of the Getu Valley, China. This humid part of the country is primarily an agricultural area where rice, wheat, corn, and soy beans are grown, all pressed against a backdrop of pure beauty. Then there’s Shopify. The ecommerce brand uses Facebook to sell themselves by showcasing customer stories and case studies. And IKEA is a great example of superior customer service on Twitter. They use their 280 characters to solve problems and answer questions—often with a bit of humor. Notice that each of these accounts has a consistent voice, tone, and style. Consistency is key to helping your followers understand what to expect from your brand. They’ll know why they should continue to follow you and what value they will get from doing so. It also helps keep your branding consistent even when you have multiple people working on your social team. For more on this, read our guide on establishing a compelling brand ‘voice’ on social media. Consumers can also offer social media inspiration. What are your target customers talking about online? What can you learn about their wants and needs? If you have existing social channels, you could also ask your existing followers what they want from you. Just make sure that you follow through and deliver what they ask for. Sharing great content is essential, of course, but it’s equally important to have a plan in place for when you’ll share content to get the maximum impact. Your social media content calendar also needs to account for the time you’ll spend interacting with the audience (although you need to allow for some spontaneous engagement as well). 20 percent can directly promote your brand. One-third of your social content promotes your business, converts readers, and generates profit. One-third of your social content shares ideas and stories from thought leaders in your industry or like-minded businesses. One-third of your social content involves personal interactions with your audience. Once you have your calendar set, use scheduling tools or bulk scheduling to prepare your messaging in advance rather than updating constantly throughout the day. This allows you to craft the language and format of your posts rather than writing them on the fly whenever you have time. Your social media strategy is a hugely important document for your business, and you can’t assume you’ll get it exactly right on the first try. As you start to implement your plan and track your results, you may find that some strategies don’t work as well as you’d anticipated, while others are working even better than expected. In addition to the analytics within each social network (see Step 2), you can use UTM parameters to track social visitors as they move through your website, so you can see exactly which social posts drive the most traffic to your website. Once this data starts coming in, use it to re-evaluate your strategy regularly. You can also use this information to test different posts, campaigns, and strategies against one another. Constant testing allows you to understand what works and what doesn’t, so you can refine your strategy in real time. Surveys can also be a great way to find out how well your strategy is working. Ask your followers, email list, and website visitors whether you’re meeting their needs and expectations, and what they’d like to see more of. Then make sure to deliver on what they tell you. When you update your social strategy, make sure to let everyone on your team know. That way they can all work together to help your business make the most of your social media accounts. Once you’ve mapped out your social media marketing plan, use Hootsuite to schedule all of your social media posts, engage with your followers, and measure performance. Try it for free. Click here to start using the template in Google Docs.